Some 204th Airlift Squadron retirees recently had another of their frequent retiree get together. 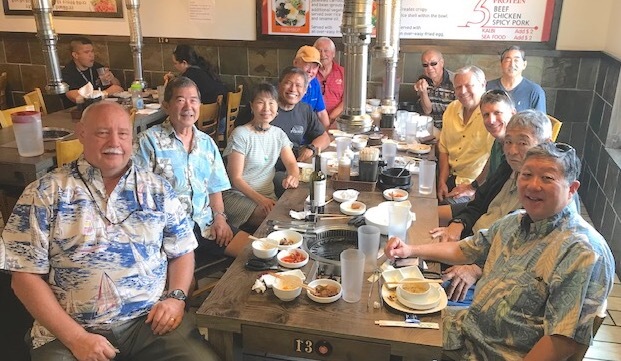 Attending were from the left side of table: Neal Ernst, Gordon Fujimoto, Mona Fujimoto, Kevin Garcia, Jimmy Dang, Jimmy Aea, Tony Wong, Phil Tokunaga, Pete “Skipper” Pawling, Mike “Inch” Compton, Jerry “FANG” Aoki, Lester Hirano. Special thanks to Jimmy Dang foe sending Retiree News this photograph. « Thinking of Paying for Long-Term Care from Your IRA? Think Again.